Abu Dhabi: An Afghan city’s tale of development unfolds the hard work of Afghan expatriates in the UAE and their trust in Afghanistan’s democratic system during the past one-and-a-half decade. The fact that land price in Khost city, the headquarters of an impoverished agrarian province, has grown to the levels of the capital city of Kabul, even reflects the growth of Afghanistan’s young democracy, a top Afghan diplomat told Gulf News in an interview on the occasion of 98th Independence Day of Afghanistan. Although many Afghans have been living here for several decades, they were just remitting money for their family’s expenses back home and holding back their savings in the past, he said. But they started investing in real estate and commercial sectors for their own future when the successive democratically elected governments succeeded in improving the peace situation. “Now the development in Khost city reflects the Afghan expatriates’ trust in their young democracy,” Zikria said. He said 60 per cent of the Afghan expatriates in the UAE are from Khost province and majority of them [60 per cent to 70 per cent] are living in Abu Dhabi and Al Ain. About 1,500 Afghan businessmen in Dubai constitute the largest Afghan business community anywhere in the world, the ambassador said. Women’s empowerment, he said, is a major achievement of Afghanistan. “Earlier women used to be beaten in public. Now many women have become ministers, parliamentarians, professors etc and made their presence felt in many respectable positions,” the envoy said. The UAE is among the top ten donors of Afghanistan. The UAE has undertaken many development projects, including a 3,000-apartment complex in Kabul and one of the largest universities in the country, he said. “The UAE is our partner in progress. We have strong and stable bilateral relations,” Zikria said. 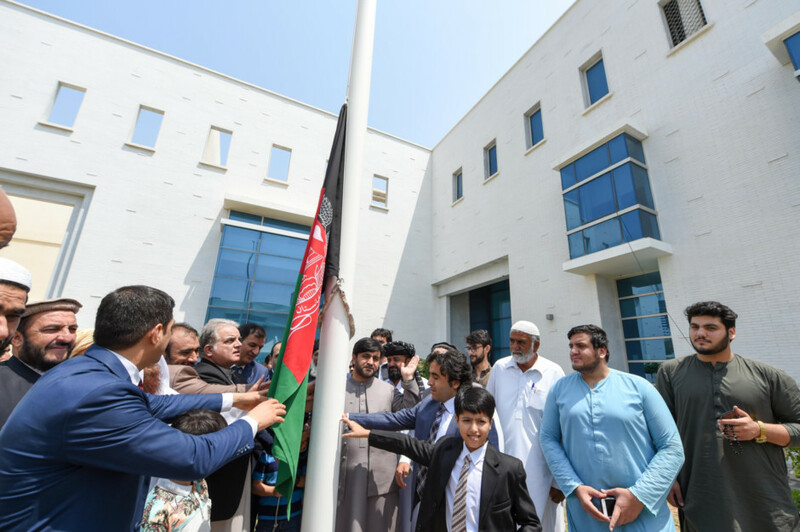 The ambassador hoisted the national flag at the embassy in Abu Dhabi in the presence of community members who came from several parts of the UAE to celebrate the occasion. The expatriates told Gulf News they want their compatriots back home give up weapons and adopt education for the betterment of the nation. “Afghans have to abandon guns for pen to achieve eternal peace in the country,” said Obaidullah Mohammad Hafiz, 17, a student from Khost province. Echoing the same dream, Naimatullah Safi, 37, a general manager with a private firm in Abu Dhabi, said: “We, a group of expats, are planning to establish a peace council in Abu Dhabi, and its branch will be opened back home as well,” said Safi who is from Kunar Province. Najeebullah Mohammad, 16, a grade-10 student at a Sharjah school, said he would spend his time to educate young Afghans when he goes back home after a few years. His father, Abdul Rahim Khazi, 48, a cleric at an Islamic Centre in Dubai, said he wants to emulate the success story of the UAE in Afghanistan. “We want to make our country like the UAE,” he said.